Jodhpur : The hearing in a case of possession and use of illegal arms by Dabangg khan of bollywood Salman Khan, has been deferred to 3 March by the Jodhpur court, that provided a small relief to producers of his two films that are set to release this year. court was scheduled to pronounce verdict in the case on Wednesday. Salman and few other Bollywood stars were accused of poaching blackbucks on the midnight of 1-2 October, 1998 during the shooting of Hindi movie Hum Saath Saath Hain. Two blackbucks, a protected animal under the Wildlife Protection Act, were killed on the outskirts of Kankani village near Jodhpur. The star was also accused of carrying and using illegal arms. 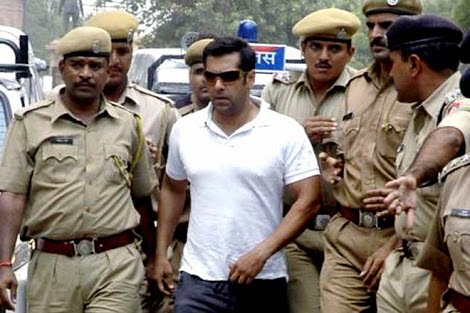 A police complaint was filed against Salman Khan on charges of being involved in the hunting of protected blackbucks. The 49-year-old actor Salman is currently in Gondal near Rajkot, Gujarat for Sooraj Barjatya's 'Prem Ratan Dhan Payo'. His other film 'Bajrangi Bhaijaan' being directed by 'Ek Tha Tiger' helmer Kabir Khan has wrapped up shooting and is currently in post production stage for a mid-year release.